Learn, be active, and have fun! 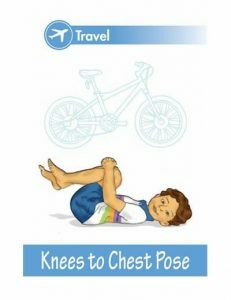 Yoga cards for kids provide an engaging and easy way to practice yoga poses, whether your child is a beginner or an expert yogini. Introduce one yoga pose at a time or put a few yoga poses together to create a meaningful story sequence. Make the yoga experience relevant and meaningful to your children, and no doubt, they will be coming back for more. Use the yoga cards in your home, classroom, or studio. Or take yoga cards with you on your travels. 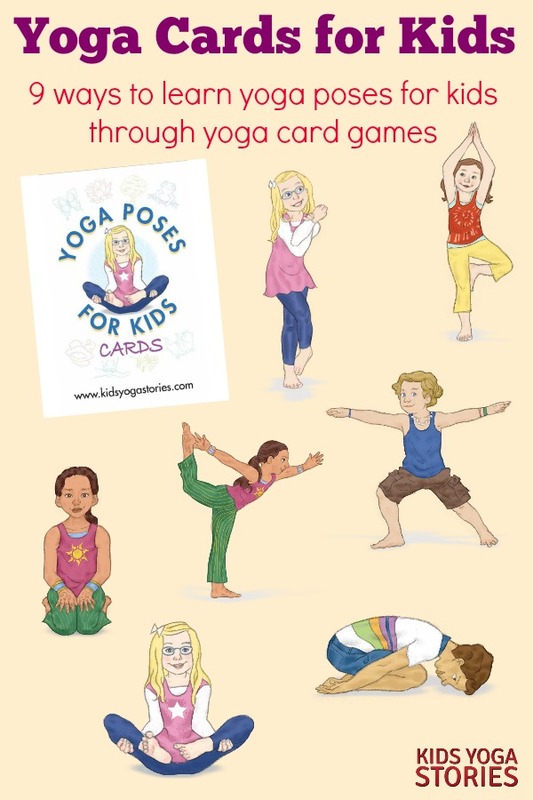 Yoga cards also encourage independent creative play. Let children’s imaginations run wild, while they move their bodies! Use the category color band on each card to help match the keyword and corresponding yoga pose. Then you can practice the poses associated with each keyword. Talk about your favorite pairs and which ones are easiest to remember. Pick three to six yoga pose cards (with or without their matching keyword card). Then create a yoga pose sequence. You could make up a story or situation to go with the sequence. For example, Dancer + Tree + Eagle cards: you could pretend to be a fairy who goes to a ball in the trees and dances with an eagle. Place only the pose cards facedown together in a pile. One player flips over the top card, and everyone has to “strike a pose.” You could do this with pose cards, keywords cards, or the whole pack. Place all the yoga cards upside down in rows. Take turns flipping up two cards at a time. If the player gets a yoga pose matched with its keyword, then that player keeps the pair. The game continues until all pairs have been matched up. Gather together a deck of keyword cards and place facedown. Each player takes a turn at selecting the top keyword card and has to guess the matching yoga pose. For example, if the player picks a “dog” card, he or she has to say or act out Downward-Facing Dog Pose. If the player can’t remember the matching yoga pose, then he or she can ask her friends for help. Repeat the process until each player has had a turn. Choose one category of cards to gather together (ex. Travel, Earth, People, or Animals). Create a logical, safe yoga sequence with all or some of the yoga pose cards in that particular category. 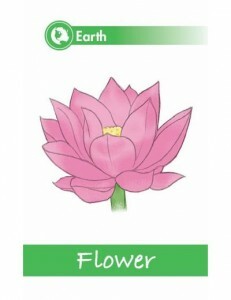 For example, in the Earth category, you might choose Seed + Flower + Tree to create a flow sequence. Gather together a deck of only the pose cards and place them facedown. Each player takes a turn at selecting the top yoga pose card, without any other players seeing the card. 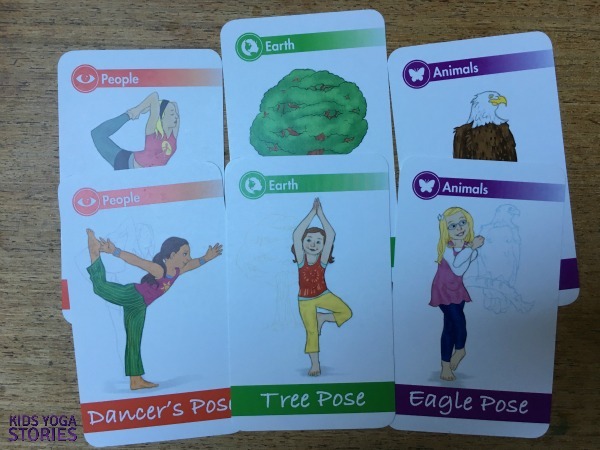 The player demonstrates the pose on their selected card, and the rest of the children have to guess the name of the yoga pose. Repeat the process until each player has had a turn. 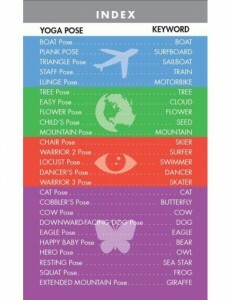 Gather together a deck of pose cards. Pick one yoga pose card at a time and brainstorm a list of other keywords that could represent that yoga pose. For example, Squat Pose could be a duck, monkey, frog, or ape. 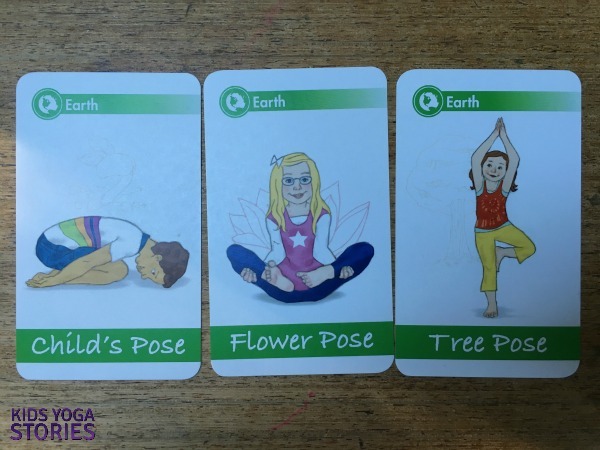 Using the entire Yoga Poses for Kids Cards deck, have each child come up with his or her very own signature yoga pose sequence (maybe three to five poses, depending on the age and needs of the child) that could be used to help calm their bodies and minds. Spend some time going over their sequence, ensuring that it’s easy for them to practice and remember the sequence. Grab a die from a board game you have at home. Write the numbers 1 through 6 on sticky notes, one note for each number. I wrote both the numeral and the number symbol found on dice. 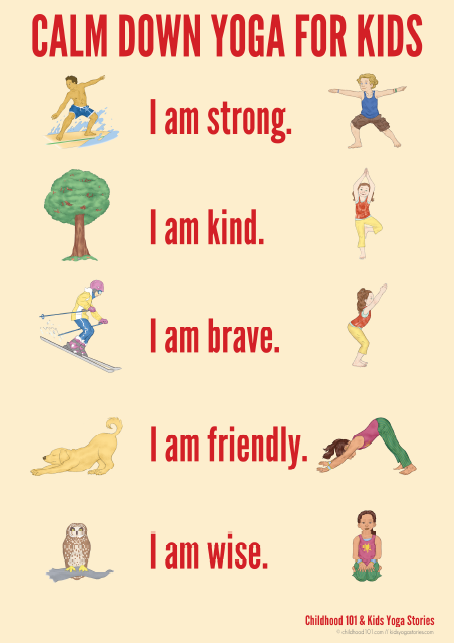 Have your child pick out 6 yoga pose cards from the deck. Stick a number note on each yoga pose card. I put the yoga poses in a logical yoga flow with standing poses first, followed by floor poses, and resting poses. Roll the die and practice the yoga pose associated with that number. You could use a large die if working with a large group of kids. 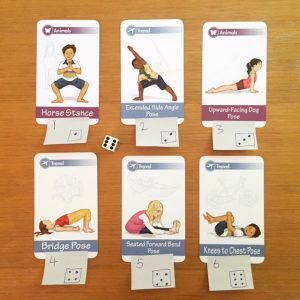 This simple dice yoga game would be great to bring traveling with you because all you need is a set of dice and yoga cards. Your child can easily change up the game by simply sticking the numbered sticky notes on different cards. My daughter and I playing yoga dice game. 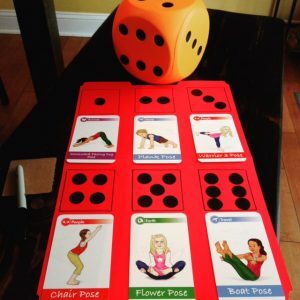 Dice game: Picture credit to Infinite Kids Yoga. Sit on the floor, facing each other, and deal five cards to each player. Each player takes a turn flipping over one card from his or her own row of cards. Each player should always have at least five cards. Each time a pair is found, the player who hands over the matching card draws another card from the deck. If you have both flipped over all of your cards without finding a matching pair, then take turns drawing from the deck. The player with the most pairs wins. 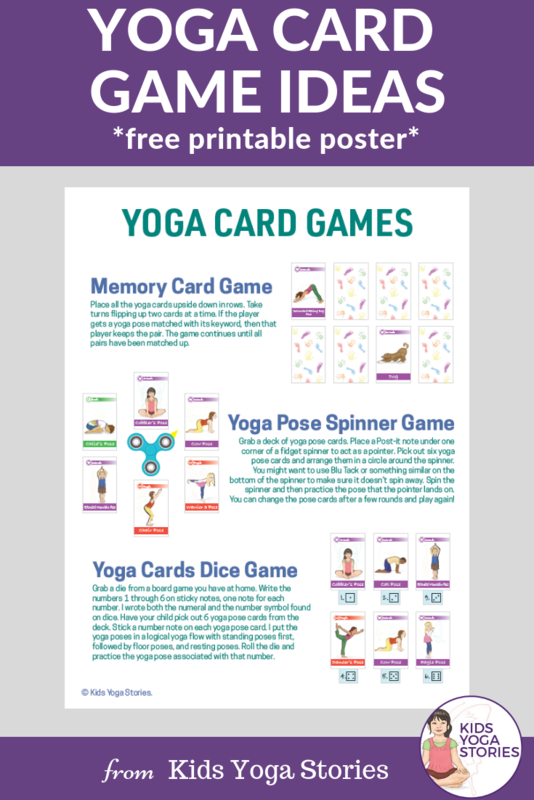 Download the Yoga Poses Card Game instructions here. 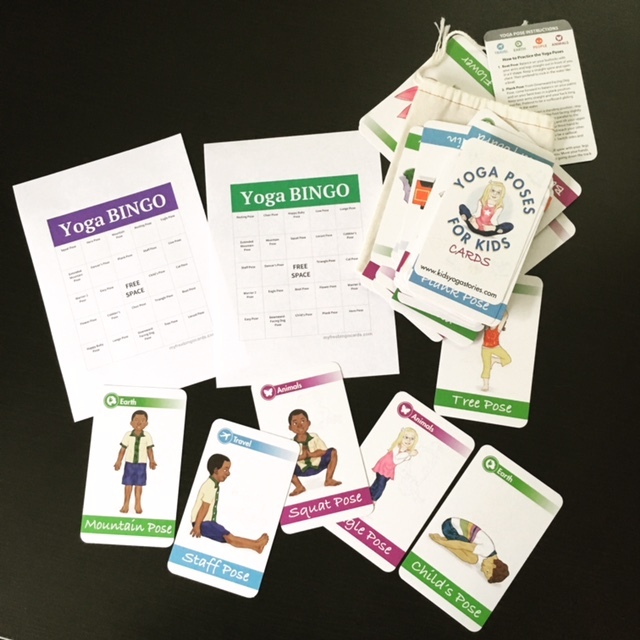 Download thirty Yoga BINGO cards that have the twenty-five yoga poses from our Yoga Poses for Kids Cards (Deck One) or customize your own. Click here to get started! The first person does a yoga pose (or you can pick a yoga pose from a Yoga Pose Card Deck). The second person does that first pose and then adds another yoga pose to the sequence. The first person then does the first two poses and adds a another pose. Play continues as long as you like! Me: Chair Pose. Dancer’s Pose. Anamika: Chair Pose. Dancer’s Pose. Warrior 3 Pose. Me: Chair Pose. Dancer’s Pose. Warrior 3 Pose. Warrior 2 Pose. Anamika: Chair Pose. Dancer’s Pose. Warrior 3 Pose. Warrior 2 Pose. Triangle Pose. Me: Chair Pose. Dancer’s Pose. Warrior 3 Pose. Warrior 2 Pose. Triangle Pose. Eagle Pose. 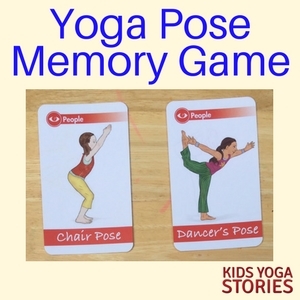 See How to Play a Yoga Pose Memory Game here. The other day, my daughter and I were looking for something fun and active to do indoors on a rainy afternoon. We got out her fidget spinner and a deck of yoga cards and played a yoga pose spinner game. It was super fun! Grab a deck of yoga pose cards. Place a Post-it note under one corner of a fidget spinner to act as a pointer. Pick out six yoga pose cards and arrange them in a circle around the spinner. You might want to use Blu Tack or something similar on the bottom of the spinner to make sure it doesn’t spin away. Spin the spinner and then practice the pose that the pointer lands on. You can change the pose cards after a few rounds and play again! 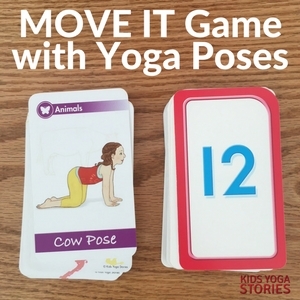 Practice counting while learning yoga poses for kids in this move it game yoga-style! Grab a deck of yoga pose cards. Take out just the cards that have yoga poses on them. 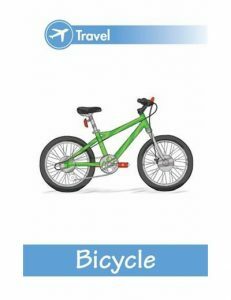 Grab a deck of number flashcards and pull out 1 to 20—or make your own 1 to 20 number cards using notecards. Make a pile of yoga pose cards and another pile of number cards, all face down on the table. 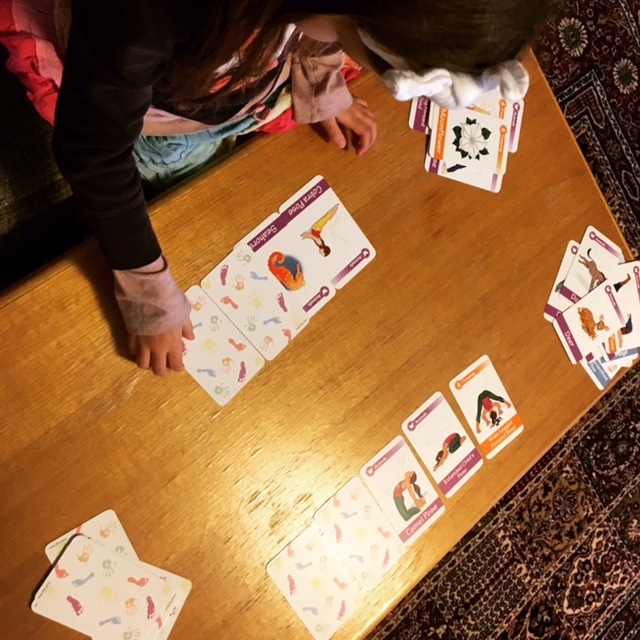 The first player flips over a yoga pose card and a number card then practices that yoga pose while counting to the number on the other card. Write the numbers 1, 2, and 3 on large popsicle sticks, one number on each stick. Print out three breathing exercise cards (or yoga pose cards). 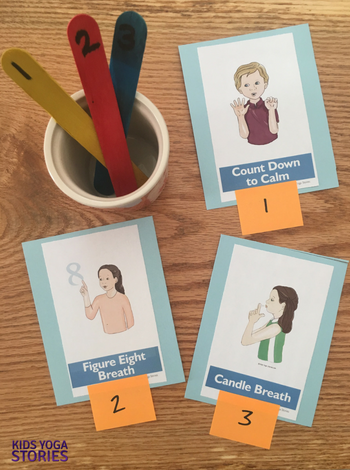 Write the numbers 1, 2, and 3 on sticky notes, one number on each note, and place one note on each of the breathing exercise cards. Pick out a numbered popsicle stick. Practice that breathing exercise with the corresponding number. If you’re working with a larger group or if you want to practice more breathing exercises, then you could easily add more numbered popsicle sticks or more breathing exercise cards. Wondering what to do with your leftover Halloween candy? Play a Skittles Yoga Game! Pour a bunch of Skittles into a cup. Have each child take out a Skittle. RED – practice Star Pose. ORANGE – practice Chair Pose. GREEN – practice Warrior 2 Pose. YELLOW – practice Warrior 1 Pose. BLUE – practice Warrior 3 Pose. 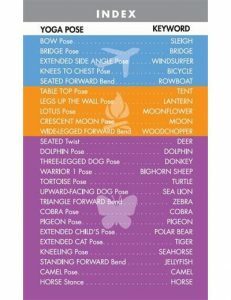 Use Yoga Pose Cards to pick different yoga poses to match the colors. Try the game with Partner Yoga Poses, Chair Yoga Poses, or Breathing Techniques. Ask children to pick three Skittles and practice three yoga poses together. Use colored beads or dice instead of candy. Make the list more open-ended for older children. For example: RED: Practice your favorite yoga pose. ORANGE: Do your favorite breathing technique. GREEN: Grab a friend for a partner pose. We hope you enjoy playing with the yoga card deck as much as we do! 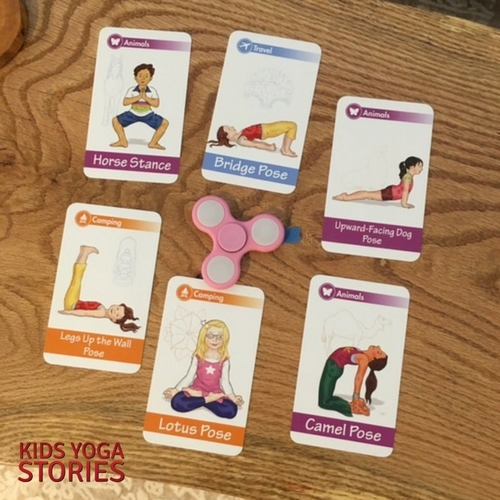 What other ways could you use the yoga cards for kids? Do you have your own games you use the yoga cards for? by adding your name and email to the box at the top of the page. How can I buy the yoga cardas and what´s the price? Thanks for your message! 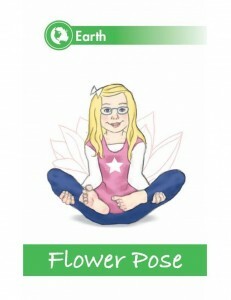 Our Yoga Poses for Kids Cards are available for purchase on our website for $18.95 here: https://shop.kidsyogastories.com/products/yoga-poses-for-kids-cards/. We ship internationally for a flat shipping fee of $10.00. So, it’s always more economical to buy more than one product on our online store. 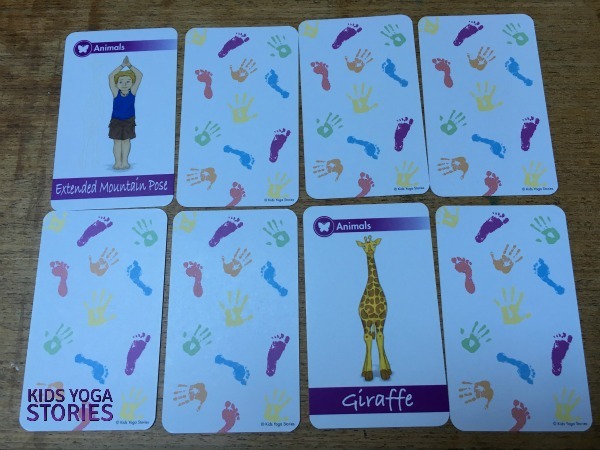 Another game I’ve played with my younger kids is, I hide the yoga cards around the classroom then when I’m finished I tell the kids they can look for them! When they are close I’ll let them know if they are hot or cold! They also have 2 figures if its an animal tree or bird, big or small! They love it getting so excited to find the next card! Everyone gets a turn, the person who finds it then sits out, and so on until everyone has found a card! This article was filled with such wonderful information. I have actually spoken to Jodi via phone so it was nice to see her picture! I teach kids yoga and always searching for new and creative ways to teach. This sounds fun. Thanks for sharing this. too cute & thanks for spreading the yoga love! also grateful to for you & giselle for the UPDATE & mention of my Outer Space dvd.